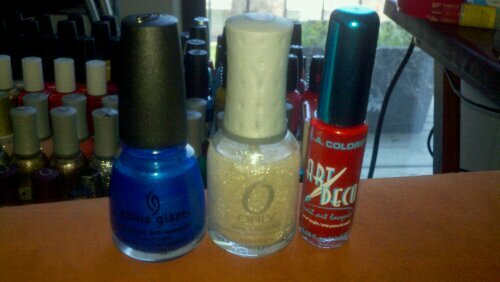 Well folks, this is the 2nd of 3 suggestions for my Nail Art Challenge Contest. Stephanie suggested that I do a manicure for this weekend’s Essence Music Festival in New Orleans. As soon as she said New Orleans, I immediately thought of Mardi Gras colors…yellow, green, and purple. I thought of Bourbon St., rich with vibrant colors and sounds…alive with history and culture. With so much inspiration to pull from, it took me quite a while to figure out what I wanted to do. And I really wanted to incorporate an existing nail trend into this manicure. I actually tried another design Tuesday night, wore it on Wednesday but I really didn’t like it. Last night, I decided upon the “moon manicure” which is also known as the “reverse-French manicure”. In a moon manicure, the moon—that lighter crescent at the base of each nail—is either left unpainted or it is painted a contrasting color to the rest of the nail. Check out this Google Image Search for examples. The moon manicure has been around for a few years though, and I didn’t really have a desire to do it…until now. I needed a way to paint my nails 3 colors without using a striping technique (which I think I do too much of as it is…). So for this manicure, I painted on a base color: 2 coats of Wet n Wild Fast Dry The Wonder Yellow. Next I carefully created a crescent shape at the base of each nail with Wet n Wild Fast Dry Sage In The City. Then, I used Wet n Wild Fast Dry Buffy the Violet Slayer to paint the majority of my nail, being careful to create a 2nd crescent of green. I wanted it to appear like the yellow was transitioning into green which then transitions into purple. Last I painted a pair of eighth notes on my ring finger using The Wonder Yellow. There you have it…my Essence Music Festival Double Moon Manicure. I hope Stephanie likes it!! It’s Memorial Day, a day to honor those military service-people who fought and died for us to enjoy freedom as we know it. To the fallen soldiers of the US Army, Navy, Marine Corps, Air Force, Coast Guard and Reserves, we love you and your sacrifice will never be forgotten. 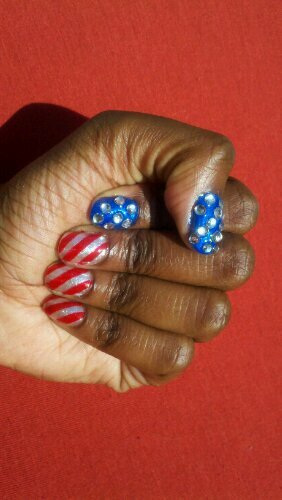 In honor and memory of those brave soldiers and as a part of my 1st Nail Art Challenge/Contest, I completed this American Flag manicure according to Syreeta’s suggestions. The base color on my thumb and index nails is China Glaze Frostbite and they are covered in rhinestones. I used a one coat of OPI Top Coat under the rhinestones then a coat of OPI Top Coat and Seche Vite Dry Fast Top Coat to affix them. On my middle, ring, and pinky nails, I used Orly Winter Wonderland for the base color and Art Deco Nail Art Striper in Red Glitter for the red stripes. It’s time for my first contest!! I was trying to wait until a certain milestone before announcing my contest but since I bought 1 item for the prize pack I plan to give away, I couldn’t wait any longer. I’m constantly surfing the internet, looking at art and my surroundings, and observing fashion trends searching for inspiration for nail art. I feel now is the time to challenge myself and take requests from you! – I will take your suggestions for nail art that I haven’t tried yet. It can be a current or vintage fashion trend, a piece of artwork, or anything you think might be a fun nail art design. Feel free to send/post links to pictures if it’ll help in describing what you want to see. – I will execute your vision to the best of my ability and post the pictures of how I interpreted it. When you see your post, if you think I could jazz it up in some way, let me know, I’ll try it and repost! – As the suggestions die down, I’ll announce an end date for the contest. On that day, I’ll check out which design was viewed the most and announce the winner! It’s a win for me because I love taking on challenges and it will be a win for you because of the goodies I plan to give away…. 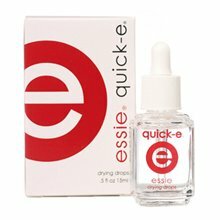 I have used these when I was in a serious rush after doing my nails. After applying a top coat, as long as the polish color underneath is fairly dry, these drops can almost instantly create a hard finish to your manicure. Now I wouldn’t wash dishes right after, but if you need to run out of the house, these can help prevent a completely ruined manicure. Someone I know actually does her nails in the car on the way to where she’s going. I won’t say any names, lol. But this would be a good product for ladies who want a finished manicure but don’t have all day to wait for it to dry. I have more ideas of what to add to the prize pack so when the suggestions start rolling in I’ll announce what else the winner will receive. Spread the word folks! I’m ready to do the first suggested design TONIGHT! P.S. Thank to my girl C.A. for sparking the idea on how to run the contest. Luv ya!